Paul Davis On Crime: McCain Calls Obama's "Pinprick" Iraq Strikes "Meaningless" And "Almost Worst Than Nothing"
McCain Calls Obama's "Pinprick" Iraq Strikes "Meaningless" And "Almost Worst Than Nothing"
Josh Rogin at the Daily Caller offers a piece on Senator John McCain's response to President Obama's Iraqi air strikes. President Obama’s limited strikes on ISIS in northern Iraq are “pinpricks” that are “meaningless” and “worse than nothing,” according to one of his fiercest foreign policy critics, Sen. John McCain. 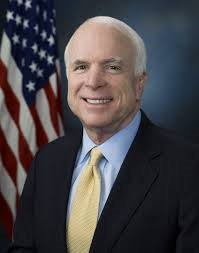 By committing U.S. military forces to fight again in Iraq while explicitly limiting the mission to protection of American personnel and Iraqi minorities, Obama has failed to come up with a plan that has any hope of stopping the ISIS advances across Iraq and Syria, said McCain. It’s a position that puts him somewhat at odds with other Republicans, who are offering cautious support for the airstrikes in Iraq – and concern that the president doesn’t have a comprehensive strategy to combat the growing threat of ISIS..
McCain, a consistent advocate for the application of American military power around the world, has long pushed for greater U.S. involvement in Iraq. But these strikes Friday were not what McCain had in mind. “This is a pinprick,” McCain told The Daily Beast in an interview Friday, about the two 500-pound smart bombs U.S. airplanes dropped on ISIS convoys Friday. The vehicles were approaching Erbil, the capital city of Iraqi Kurdistan, were many U.S. diplomatic and military personnel reside.